Describe Snapshot of Rio Tino, recent history and evolution of the “Mine of the Future” concept and Intersection of strategy, technology and mining of resources heading? The report deals with strategic resource management, practice and its importance in the mining industry. The strategic resource and operation management has become one of the vital disciplines in several organizations. The ultimate purpose of managing strategic resource and operation is to help an organization to increase its performance through improved efficiency, effectiveness and flexibility. In these dynamic days, the essence of resource management is essential for running a business, strengthen the firm’s competitive position, satisfying its customer’s expectation and achieving the performance targets. The research basically conducted on Rio Tinto, which is a reputed international mining group, headquartered in the UK. The primary aim of the study is to provide a clear insight about the review of the tangible assists of the firm and its value chain analysis in order to achieve strategic outcomes with respect to the mining company, Rio Tinto. The study also intends to reflect the number of social and environmental issues that rely upon the heart of sustainable business strategy. The name Rio Tinto is well known throughout the globe primarily for its exquisite diamond that founds in one of their mining operation in Africa. The company has started its operation in the Great Britten and now it is spread evenly around the world. In mining operation, Rio Tinto is the biggest name and was made its position after their merger with CRA in 1995 (Fisher, 2012). Rio Tinto has been regarded as the one of the most resourceful company and has set their image as an extremely powerful international organization in the global market. Major products of the company are copper, gold, diamonds, iron, industrial metals, thermal, uranium, and aluminum. Presently the operation of the group has segmented in various countries in the world, for instance, Canada, Europe, Indonesia, South Africa, Mongolia, US, Australia, and U. Western Australia is the key region of the company’s portfolio. In this region, the group has 15 iron ore mines, a 1,700 kilometer rail networks, three port facilities and related infrastructure (Rio Tinto Australia, 2015). The developed infrastructure allows Rio to expand in this region significantly. As several mining companies are a presence in Australia, Rio has got a golden chance to develop at a rapid pace in recent years. Apart from that, North America (countries such as Canada and US) is also a vital region of the group and it holds for 30% assets of Rio. These regions have a politically stable environment and well-developed infrastructure. It produces copper, coal, borates, ore, diamond, and gold. The rest of the company’s assets are located in South America (4%), Africa (6%), Indonesia (1%) and Europe (4%). A value chain analysis is a chain of activities that operate a firm to deliver high-quality product or service to its customers. 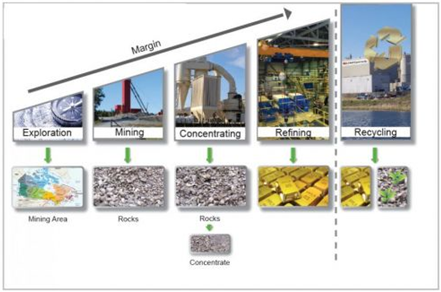 The value chain process in Rio begins with exploration and goes through the several sections with high investment, high risk to get rich natural resources, low-profit margin and so on and ultimately focus on refining the extraction of precious metals (for graphical representation of Rio’s value chain procedure, refer to Appendix 1). The margin of the mine tailing recircling is upward moving as it is low risk, enough raw materials are available in the company and no new burdens arise (IBM, 2009). Value creation occurs predominantly in the productive stage of the business. Regarding the iron ore market, there is a significant demand especially from countries like China and India due to their urbanization and industrialization strategy. At the same time, there is an increasing competition between the giant iron ore mines, especially between Fortescue Metals, Rio Tinto and BHP Billion (Rio Tinto Innovation, 2013). Rio Tinto’s “Mine of the Future” programme is the step ahead towards adopting high competition and increasing demand. 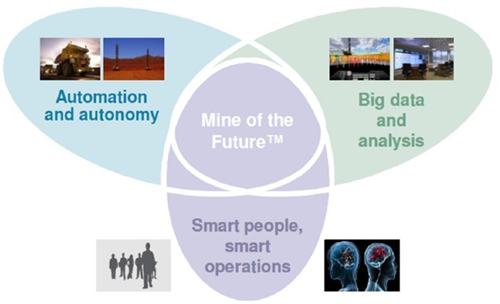 The group has adopted “Mine of the Future” programme for developing fully autonomous operated mine strategy. 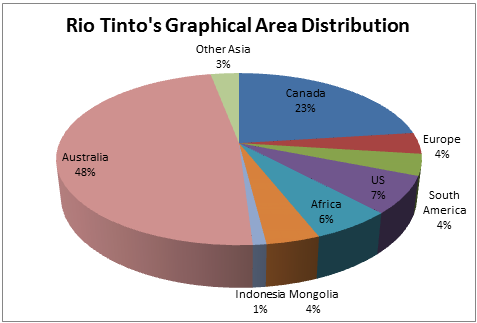 Rio Tinto seeks to invest and operate in long-term, large and cost competitive mine industries that are not driven by the choice of the commodity, rather the quality of opportunities (Rio Tinto Iron Ore Pilbara, 2015). With this policy, the group wants to work in an ethical and socially responsible manner to enhance social wellbeing, sustainable development, and economic prosperity within their strong governance system. Recently, Rio Tinto has started an innovative program, namely ‘Mine of the future’, which mainly focuses on creating extraordinary levels of automation and remote the operation in the mining industry. The strategic intent of the program is to revolutionize the new way of mining that has not been an attempt in the past centuries. The program was started on 18 December 2008 and aimed to reduce the carbon footprint in order to provide greater efficiency and improved management at the lowest cost (Fisher, 2012). Rio Tinto believes that such quality condition will help them to retain and attract superior quality staffs in the competitive labor market. The ‘Mine of the future’ is a forward looking strategy of Rio group where they are looking beyond their current existence and thinking about the ways through which they can implement better management strategy in future. Grant Thorne, the executive for technology and innovation group of Rio Tinto has said that they always aim to provide a substantial safety, efficiency and predictability to their workers and the ‘Mine of the future’ program is crucial steps taken ahead by them to satisfy these obligations. The ‘Mine of the future’ project was first launched in 2008. By the April of this year, a mass of robot army was deployed in the Pilbara region of Western Australia to move 100 million tonnes traveled to more than 1 million kilometer. Moving materials by using the robot army is one of the key components of Rio’s strategy (Engineers Australia, 2015). It is effective to reduce cost, increase efficiency, improve health, safety, and environmental efficiency. The program is all about emphasized on finding most advanced ways to extract minerals from the deep mine within the earth and thereby reduce environmental impacts. With the strategy of ‘Mine of the future’, Rio Tinto has successfully met the expectation of various customers from emerging developed countries around the globe. Rio Tinto seeks to become a global mining leader by achieving and maintaining sectoral leadership in terms of operational excellence, innovation, sustainable development, and innovation. The group has successfully carried out its operations on the global scale by meeting and satisfying the needs of their customers in a various section of the world. In recent years, they have “the way we work” approach in order to achieve economic prosperity, social wellbeing, improved government system and sustainable development (Australia Mining Review, 2014). In order to manage their business in the international market, Rio follows some basic principle in their operation and they are maintaining internal performance with external drivers, realistic achievements with sustainable stretch, including corporate value to maximize shareholder’s return and transparency in their operation management. They believe that all kinds of injuries and incidents are preventable. They have created an environment where all employees have sufficient knowledge and desire to work safely and can go their home at the end of the day. Implementation of the safety programmes in their operational process currently being rolled out with a particular focus to achieve global supply chain management. Another aspect of their operational strategy is positive financial delivery (Itnews for Australian Business, 2015). Majority of the Rio’s assets provides a positive return in respect to other mining industries. Rio has achieved this through constant delivery of the business improvement programs, application of the latest technology and investment assets in the lifecycle. Rio Tinto’s workforce is one of the crucial strategic resources that the company manage properly to establish its position in the global market. Rio believes that attracting, developing and retaining skilled employees is critical to improving business performance. An integrated talent sourcing, total reward architecture etc. are some example that Rio used to optimize the value of its workforce. The company joined with international rail specialists to implement the world’s first long deployment of haul less driver train (McGagh, 2012). Under the “Mine of the Future” program, Rio first started to test autonomous trucks and drillers. It also established remote operation center at Perth to manage operation at Pilbara mines which are 1,500 kilometers away. The company also signed with Komatsu for 150 autonomous car deployments. Within 2014, Rio has deployed autonomous drilling system (ADS) and autonomous haulage system (AHS) trucks in their three mine site and expected to spread out the uses strategically. Rio Tinto’s “Mine of the Future” Iron Ore Project is concentrated in the Pilbara region of Western Australia. Rio’s Pilbara operation comprises three shipping terminals at two ports, 13 mines and a rail network spanning around 1,400 kilometer. They export iron ore from their port on Western Australia to Eastern Europe and Asia. The development programme that Rio has adopted to expand the global market for their product includes the development of new mines and expanding key infrastructure that allows them to transport their product in market. In 2009, their Pilbara operation was accounted for more than 170 million tonnes of their total production (Rio Tinto Sustainable development Report, 2015). It implies that, from the year 2000, Rio has expanded their capacity up to 220 million tonnes per year and this is all because of their Pilbara Iron Ore operation. Now, Rio Tinto has the vision to establish “Mine for the Future” programme to improve the ways of mining via remote and automation. They have chosen Pilbara to fulfill their vision, as this is a part of their current ore extraction mines. The vision of the project was to transform mining into low effects, i.e. mining which has a very low-level impact to the environment. It will also improve the health and safety of the workers by using robot technology. In the current state of rising demand, competitive pressure, decreasing productivity and skill shortage and scarcity of resources, mining companies are upgrading their operations. Operational excellence is one of the crucial strategies that mining companies are trying to implement for achieving operational efficiency, high operational performance, improved process, and cost control. In this context, “Mine of the Future” is an example of operational excellence that Rio executed along with their supply chain management to maximize their shareholder’s value (Rio Tinto, 2006). However, Rio needs to be very cautious about the negative environmental impacts that it imposes on its stakeholders, especially on the customers and local communities by ignoring their rights and interests. Nowadays, mining companies are trying to get benefit from integration and coordination of all supply chain activities flawless process. The supply chain activity includes everything, from product development to production, sourcing, logistics as well as marketing. Effective supply chain management is likely to fulfill Rio’s strategic intent, for example, production at a right cost via high performing leans, maximizing portfolio via supply chain capabilities and value-driven growth via supply chain synergies. “Mine of the Future” is the innovative execution of mining process that emphasis on end-to-end information technologies and cutting-edge technology to extract iron ore and minerals deep within the earth while reducing the environmental impacts. The four major components of “Mine of the Future” programme are Automated Drilling System (ADS), Autonomous Haulage System (AHS), Driverless Train System (DTS) and Operation center (Rio Tinto Marine, 2015). The Operation center (OC) or Perth control center has the facilities that enable Rio to operate all the mines, rail systems, and ports from a single location. It receives a wide amount of data from various sources including mine site based CCTV cameras and voice mobile radio channels that facilitate the production and transportation system to be monitored by OC. More than 400 operators are employed to manage the entire Pilbara iron ore network. OC uses special software that analyzes the complex data set and creates a user-friendly 3D display of mine that helps the supervisor and controller to form an interaction with the mine activities. OC is not only important to flow information into Iron Ore supply chain, but also crucial to provide scalability to the company through big data analysis. Mine site based operational activities includes loading and haulage, drilling and blasting, process and wash plants, processing and stockpiling etc. At the mine site, each fleet constitutes trucks and loader units. Currently, there are 53 AHS trucks to move high-grade ore to the load-out sites and processing sites. Each AHS truck is capable of carrying 295 tonnes per load. These trucks are equipped with high-precision GPS, radars, obstacle detection system and wireless network communication. The radars help to move the truck quickly and safely whereas the obstacle detection system helps to reduce the speeds if required. These trucks send information to OC and in turn receive information from OC regarding the speed and target course. According to McGagh (2012), the AHS trucks extended the tire life, enhanced the haul cycle time, lowered maintenance cost and reduced fuel uses. These benefits suggest that AHS trucks not enhanced the overall productivity, but also it reduced some environmental and social issues. Rio Tinto operates three autonomous drills at the Pilbara mine site. The automated blast-hole drill system enables an operator to operate multiple drilling by using a single console at a particular location. The human operator will control the first drilling and gradually the control will move to the OC in Perth. The ADS reduce the health and safety concerns of the workers and improve efficiency in blasting and drilling operations. It improves the recovery of the ore body by reducing the amount of waste, more predictable and consistent outcomes from blasting and provides more productive workforce as a result of remote control operations. Port-based operational activities comprise the rail networks that transform Iron Ore from mine site to ship-loading, car-dumping and stockpiling for export. They have used Driverless Train System as a substitute of existing train system in which each train drew out over 3 kilometers in length (YouTube, 2015). The loading capacity of these trains is the same as the 250 cars. It enhanced the iron ore carrying capacity and improved the environmental impacts through greater flexibility in train schedules, reducing delivery cycle time, lowering the energy costs, removal of driver change over time and reduction in the carbon dioxide emission for each unit of iron ore production. It expected to complete their driverless project within 2015. For the development of remote control rock breaker, remote shipping loading and run-of-mine bin for ore processing, Rio is now working with Commonwealth Scientific and Industrial Research Organization (CSIRO). Similarly, the teleportation of the loading process enables the operators to work beyond the line-of-sight with the video image and access the additional sensors to observe the production process. Another developing project of Rio under “Mine of the Future” program is Excellence center and Peak-float. Excellence center allows the team member to enhance productivity, take a better decision, rescue cost by virtual collaboration with the experts of the organization and access real-time data from the operation. On the other hand, Peak-float is a high performing computer program that floats condition to ensure maximum mineral recovery (Rio Tinto Sustainable development Report, 2015). Before “Mine of the Future” program, Rio Tinto has been using an incremental innovation procedure along the life cycle of their business, such as developing the first and second phase of the Pilbara mine operation. However, since 2008, it has undertaken the “Mine of the Future” program to bring a change in their innovation strategy and make it significantly different from there as usual business process. The initial observation of “Mine of the Future” program suggests that Rio Tinto has initiated the program on the basis of their strong innovation capabilities and financial resources. They believe that “Mine of the Future” project will provide them with a sustainable competitive advantage as well as help them to deliver superior value to the stakeholders. 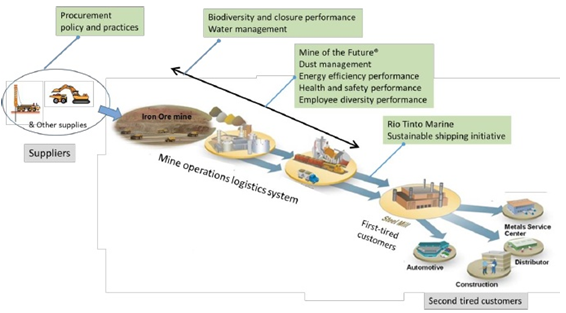 According to the official website of Rio Tinto, the values that Rio offers to the stakeholders includes enhancing safety to their workers, reducing cost to shareholders, eliminating waste and improve overall equipment effectiveness, reducing the environmental impacts to the community where they work and improve quality of the product and dependability of the customers (YouTube, 2015). Rio has underlined a strong commitment to delivering its shareholder’s value and maintaining capital discipline. The world-class portfolio of their high-quality assets help them to maintain a strong EBIT margin and are in a well positioned to generate free cash flow. However, from the supply chain management aspect it can be said that “Mine of the Future” program of Rio completely focuses on producing and delivering high-quality product but fails to provide emphasis on the supplier and customer level performance. The non- financial matrix of production process includes the quality of the product, production cost, delivery of flexibility and reliability, the speed of delivery and so on (Rio Tinto, 2006). The “Mine of the Future” program has successfully contributed to the aspect of the speed of delivery, cost, and quality of production and delivery reliability. In this context, the Relational View (RV) can be discussed. The Relational View defines the relationship as a potential source of superior performance (Engineers Australia, 2015). In the light of RV, it can be said that, if Rio Tinto could establish a supply chain management procedure utilizing the big data, it would greatly assist to form a stable and long-term relationship with their suppliers and the customers. One significant point from the study is that “Mine of the Future” may results in low-cost producer and oversupply that could impact the global iron ore market price, gain the competitive advantage in the market and become low-cost producer in the international field. For the mining company, the license to operate is under the scrutiny as countries have given great emphasis on the health and safety aspect and social rights for the local communities. So, it is important for Rio to establish an honest agreement with its stakeholders and determine a commitment to minimize environmental impacts. According to the report of the US Environmental Protection Agency, the supply chain accounts major greenhouse emissions (Rio Tinto Australia, 2015). Thus, the majority of the companies are looking for a sustainable supply chain to ensure their long-term existence. Besides other factors, today’s supply chain management also includes the environmental and social issues. The business procedure of Rio Tinto is closely related to the environment and local community where it works. Thus, it is solely responsible to develop sustainability in its business procedure to meet the needs of the present generation without hampering the ability of the future generation to meet their demands. According to McGagh (2012), Rio Tinto is highly committed to sustainability in its supply chain management with a complete focus on environmental stewardship, social wellbeing, economic prosperity, safety and strong governance (Rio Tinto Innovation, 2013). 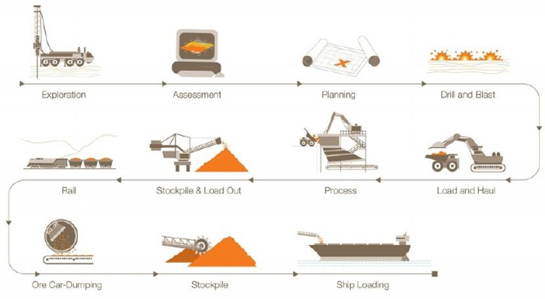 The supply chain of Rio Tinto starts with the procurement of the facilities that are necessary for its operations (as depicted in figure 5). In their procurement principle, Rio Tinto clearly mentioned the minimum standard of health, ethical, environmental, anti-corruption practice and human rights that every supplier needs to meet or exceed. The logistic system of Rio Tinto comprises (1) resource development including exploration, assessment, and planning, (2)mine operation encompassing drilling, loading, blasting, stockpiling, haulage and loading out and (3) rail transportation including ship loading and car damping (refer to Appendix 2). At every stage of the supply chain, the company is highly committed to manage the risk sustainably and deliver positive value to their shareholders. The goal of the company for safety is zero harm as it recognizes that healthy workers are essential for business growth. Rio also believes that respect to the employees is central for creating harmonious workplace (Fisher, 2012). So, the company has developed standard policies and guideline related to occupational health, safety, and human rights. The human rights policy of Rio Tinto covers intimidation, child labor, sexual harassment and discrimination (Australia Mining Review, 2014). Regarding the environment and communities, it has been viewed that Rio Tinto respects the diversity of the indigenous people, their history, tradition, and cultures. Hence, the company has developed a standard community policy to promote collaborative engagement at local, regional, national and international levels. In order to improve environmental management, Rio has developed several opportunities, for instance, sustainable water management at every stage of mineral exploration, protecting biodiversity, mine development and evaluating the divestment of assets. The management plan also developed to ensure sustainable economic outcome after site operation. Due to cost pressure, competing for resource and corporate social responsibility (CSR) issues in the mining industry, Rio has turned its business process from incremental innovation to step change innovation (IBM, 2009). The “Mine of the Future” program mostly focuses on the logistic system of the mine operation. Under this program, AHS trucks are used for loading and hauling process, ADS is used for drilling and blasting and the autonomous train is used to move iron ore from mine site to port. The program also offers benefits to the shareholders in terms of improved health and safety, reduced environmental impacts and increased productivity. The workforce of Rio Tinto gets health and safety benefits through reduced risk in several segments, for instance, reduce human exposure to equipment operations and geotechnical risk, reduced incidence of accidents etc. “Mine of the Future” program has substitute labor with the capital to achieve better production at minimal risk. Thus, it has reduced number of employees and thereby labor cost, costs of housing employees at the mine site and environmental impacts. In addition to that, the program also has eliminated some sources of inefficiencies such as unnecessary fuel consumption, unnecessary tear etc. in a more controlled and precious manner (YouTube, 2015). The program also effectively reduces the environmental footprints by consuming less energy in the business process. On the delivery stage, Rio provides ocean freight service to its customers that generally focus on both operational standard and environmental aspect of ocean transformation. Hence, it can be said that Rio Tinto is operating in a sustainable supply chain management and provide major emphasis to maximize the shareholder value. They have likely to be achieved the supply chain sustainability by engaging their suppliers to ensure sustainable performance rather than merely a compliance. However, no data found in the literature section that implies that Rio has an intelligent supply chain system. It can improve their supply chain management system by taking the better decision about their performance and more collaboration with the partners, suppliers and other key stakeholders. “Mine of the Future” is the initial step of Rio in achieving smatter mining state. So, there are some key issues that the company needs to address at the intersection of strategy, technology, and mining of their resource heading. These issues are corporate social responsibility (CSR), business model innovation, process improvement, assets management, governance and workforce, process improvements and information collaboration (Rio Tinto Iron Ore Pilbara, 2015). In the present days, CSR becomes a pervasive and formal concept in the business context. Under “Mine of the Future” program, every machine can carry out its tasks with minimal external control or automatically. Despite several initiatives in improving environmental conditions, environmental issues like reduction in energy, soil erosion, surface water risk, specks of dust and soil waste still exists. At the same time, this program has reduced the mine-related jobs for the residuals and local communities, which provide an adverse impact on the local economic activities, especially on Aboriginal Australians. The unskilled and semi-skilled workers are started to disappear with the adoption of remote operation technology and roll-out of autonomous (Itnews for Australian Business, 2015). Hence, Rio Tinto needs to provide more emphasis on these social and environmental issues. The business model of Rio Tinto is designed to achieve its strategic intent and primarily focuses on delivering value for its shareholders. However, in the present competitive business environment, it is very important to that business model should be flexible with the dynamic market conditions and customer’s demand. In another word, business model not only needs to focus on creating value for their customers but also on the relationship building. Even though Rio is delivering added value to its customer via “Mine of the Future” program, it lacks to build a substantial relationship with the suppliers, tautomers and other business partners along with their supply chain. Hence, it still needs to work on that to ensure long-life expandable operations using their data intelligence system. The “Mine of the Future” program of Rio Tinto integrates remote operation technology and mine automation with huge capital investment. This program has been designed to promote greater efficiency in productivity as well as minimize the production cost. Hence, it is very important to measure the outcome of the process constantly and in real time to ensure best possible outcomes in efficiency, performance, energy consumption, wear and tear and longevity in the use of expensive types of machinery (Rio Tinto Marine, 2015). According to Garvey (2013), six sigma is a very fundamental change that Rio has implemented in the structure of their work to actively engage, involve and communicate with their people. Therefore, Rio needs to address more improvement process like six sigma. The existing organizational structure of Rio is characterized by a five-business-unit structure in which unit compose of five stratums between the managing director level and mining staff level (YouTube, 2015). It has been reported that regarding the “Mining of the Future” program Rio will change its future workforce requirements and the ways in which the managed their workforce. It has the potential to remove the management program from the existing five strata as the large-scale operation may lead to a reduction in the operation roles. However, it can also emerge new roles to fulfill various competency requirements, such as an aptitude for using information technology, skills and knowledge in science and mathematics and so on. Thus, Rio needs to reorganize its operational structure and make it aligned with the remotely controlled autonomous operations. Under the “Mine of the Future” program, if any kind of machine failure occurs on the mine site, the sensor on that machine automatically alert a control room 160 kilometers away (Fisher, 2012). Then the supervisor of the room assembles a virtual team to discuss the problem and finds the best possible solution. Experts from different mines are get connected in the real time as well as a team of technical support expert and a maintenance repair person. In order to form effective collaboration among these groups, the real-time information is a very important component. In addition to that, real-time information also plays a crucial role for future supply chain management process. The function of the supply chain management process can be hampered due to distorted information flow up and down. In order to avoid these issues, improvement of information integration and collaboration process will be the future challenge for Rio Tinto. 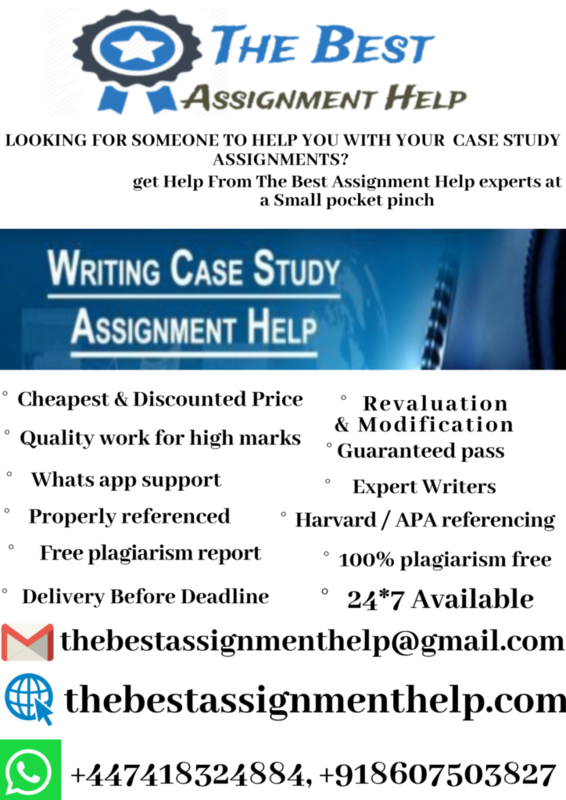 thebestassignmenthelp.com is the pioneer of providing top-quality essay help at an affordable price. With the strength of 3000+ qualified and experienced experts, we are competent in providing the best quality essay assistance in more than 100 subjects. Students, who wonder, ‘who can help me with my essay’ find our online essay help services beneficial and useful. Contact our 24×7 live customer support team to get high-quality essay writing help at an affordable price.